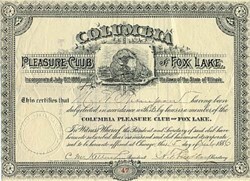 Beautifully engraved certificate from the Columbia Pleasure Club of Fox Lake issued in 1886. This historic document was printed by J.M.W. 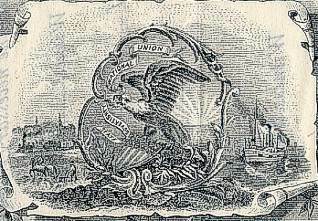 Jones Sty and has an ornate border around it with a vignette of shield with a eagle on it. This item is hand signed by the Company's President and Secretary and is over 118 years old. The Village of Fox Lake is centrally located in the �heart of the Chain O� Lakes�. Incorporated in 1907, the Village has a long history as a resort and recreation community, nestled in the middle of one of the most popular waterways in the Midwest. Through the years, it has been one of the Chicago area�s favorite destinations for fishing, hunting, boating and vacationing.